i cant get my speakers to work... they were working fine the other day but they arent working today, i checked to make sure everything is plugged in and to the right spot, they are powerd and everything. if i plug my ipod into them they work, so it has to be something with my computer. ive gone into the control pannel and everythnig looks like its fine to me so im stumped. Do you have the correct/latest sound driver? Does it have its own control center, like Realteks normally Do? do you have a front audio port? As for your network, It looks like you DO have Internet access, but are not connected to the network, a.k.a. other computers on the network. Well for the sound go to my computer icon right click go to device manager and see what little icon is beside the sound card. It sounds like something is disabled, get your original hardware cd drivers and try to reinstall the drivers agan, you must have realtek audio hd right ? For the internet problem unplug your cable modem and router for abour 45 seconds and plug them back in. Once you do so go to the networking screen of windows 7 and see if it picks up anything. Could be home, public or work, pick home and look at your network lan settings and make sure everything is setup properly. and i unplugged my modem like 5 times yesterday, one time i let it sit for like 10 minutes, and it still that problem. go to device manager I see and look at the status of the sound card and see what it says. Sorry about the man I forgot that part, kind of anxious right now, mothers car broke down and she is out on the streets somwhere..
Reread your post again get microsoft security essentials from somewhere and scan to make sure you don't have any bugs laying around. That Unknown device could be your problem. Install latest drivers for your sound device. Yes the screen tells me you aren't using a current updated driver for the sound card. Go to realtek.com download the current drivers for realtek hd audio. At other devices do you have something installed or plugged in right now, that windows 7 is currently having a tough time trying to install ? just curious is all. 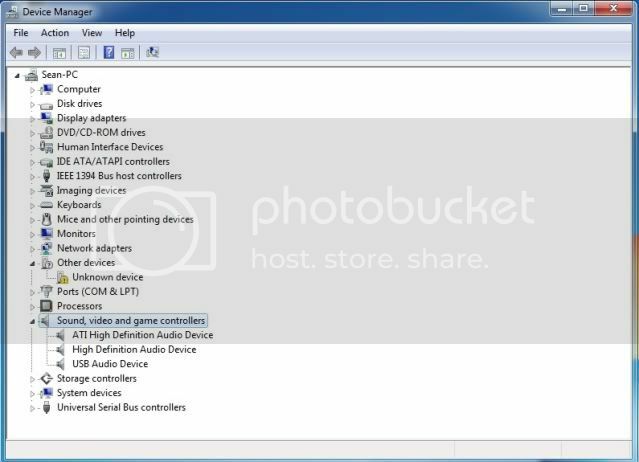 how do i know what drivers to download from realtek hd audio?